I finished my Cargo Duffle over the weekend! As I mentioned last week, the Cargo Duffle is a free pattern by Anna over at Noodlehead. 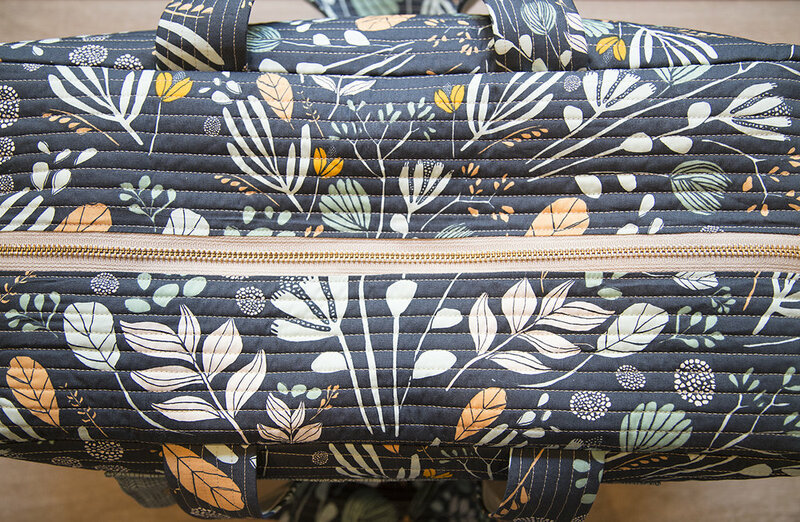 I just love Anna's bag patterns. They always have a store-bought look to them. For my bag, I used Bare Nopal in Gloom from Morning Walk by Leah Duncan as my feature fabric, Essex linen in natural for my solid, Raspberry Jam from Basic Grey's PB&J collection for my pockets and Miniflores in Sunbathed from Morning Walk by Leah Duncan for my lining (more on the lining later). This pattern was released 2 years ago, but there are benefits to being late to the party! A lot of people have made this duffle bag. Doing a quick Google search, I was able to see quite of few modifications and work some of them into my bag. The biggest change I made was widening the bag. What can I say? I travel with a lot of stuff. I used the wider dimensions over at Coconut Robot for my duffle. It was a pretty simple change and I'm happy with the increased space. The other major change I made was lining my bag, rather than using bias tape on the inner seams. I chose an orange print by Leah Duncan that really pops! You can find tips on making the lining over at Skirt as Top. 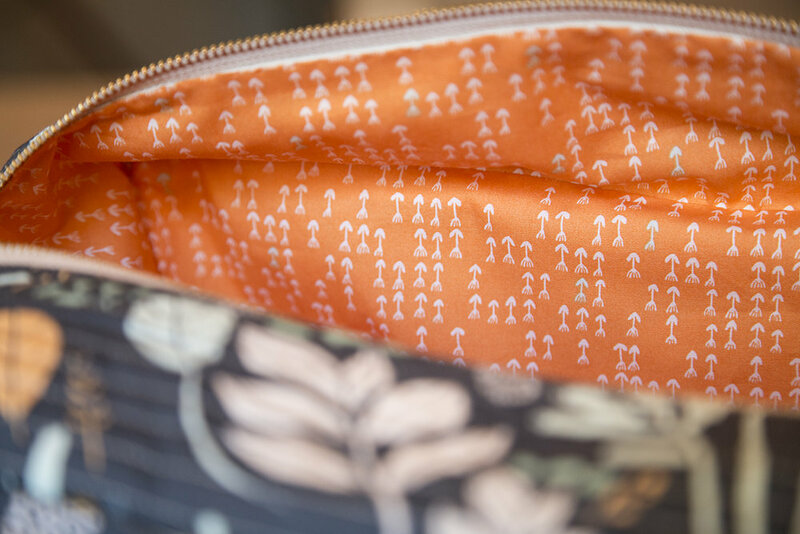 I hand-stitched my lining in along the zipper as well as the seams that connects the top of the duffle to the sides. Finally, I made just a couple other minor changes...I added fabric zipper covers to the ends of my zipper (not sure what those are called) and leather to the zipper pulls. I'm so happy with how this bag turned out! My kids have told me they want this same size for their cargo duffles. It took me about a week to make this one (working here and there) - quilt as you go can take a bit of time. I expect theirs to go faster though, as now I know what I'm going. They have both chosen some fabric by Lizzy House, and I can't wait to share them with you once they are finished. 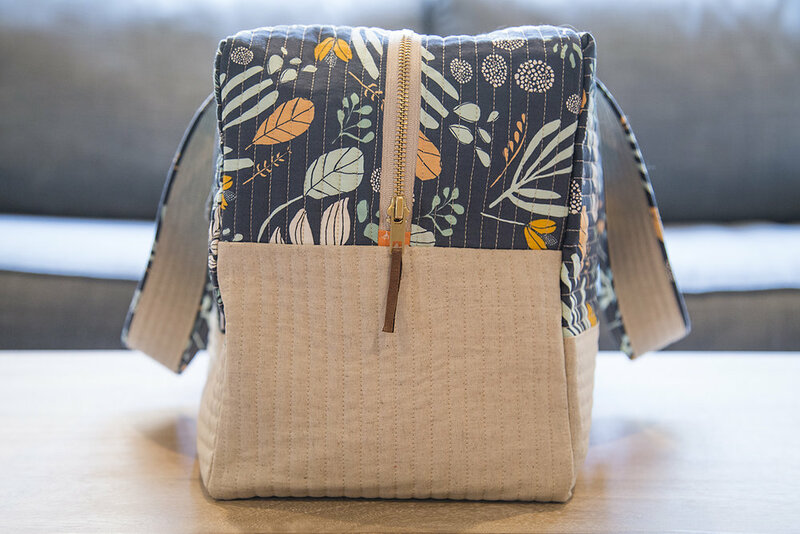 Overall, this was a great pattern for experienced bag makers. If you have a few bags under your belt, you shouldn't run into any trouble. And be sure to look online for some great inspiration as many others have made this cargo duffle over the last two years!